Good interpersonal and computer skills required, preferably experience with Mindbody software. Reset your body and your mind with this two hour candlelight yin yoga workshop. The perfect antidote for the hustle and bustle of everyday life. Join Laura for a thoroughly satisfying practice combining essential oils, candlelight, cold clothes and hands on touch. You will walk away feeling rejuvenated, reset and in a state of pure bliss. This two hour class will focus on releasing stagnation in the body, and opening up the heart, lungs, hips and spine. You will be guided through a series of poses to stimulate the flow of chi and restore a sense of vitality in the body. Yin Yoga is a practice that delves deep into the connective tissues. Helping to increase blood flow, flexibility, improve joint mobility, and leave you with an overall sense of calm. It is a series of long held poses (5 min or more), whereby the participant is asked to tune out the daily grind, focus on slowing down, and learning to surrender mind and body to your practice. This class is limited to 20 students and fills up quickly so please be sure to book your class ahead of time!!! 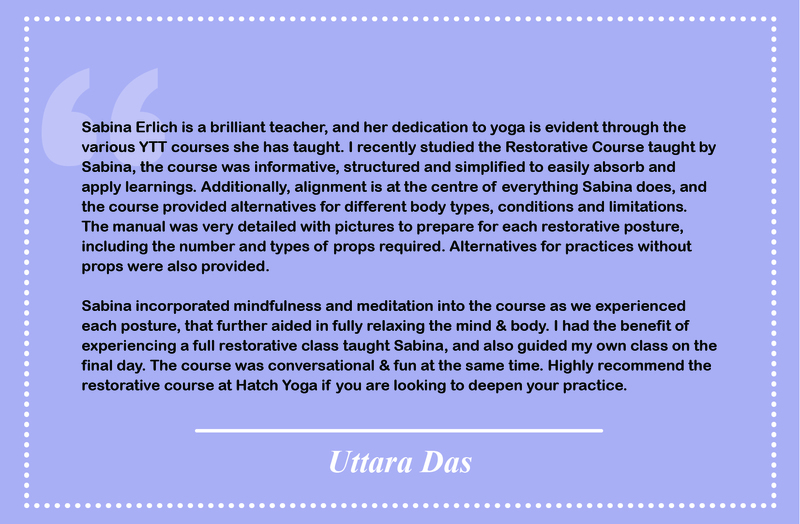 Do you want to get a better feel for your own practice and how to shift your poses to prevent injury and for greater ease in practice? In this 2-hour workshop we will work with the key concepts of alignment in yoga. It will include demonstration, discussion and experiential movement. Ideal for beginners, intermediate and advanced students and for yoga teachers who need a refresher on alignment principles. Join Sabina for this interactive afternoon. We will problem solve together to help you develop a clear understanding of how to apply key alignment concepts to your unique physical structure. Hatch Yoga is now offering Life Coaching services with Sabina Erlich. Life Coaching is an alliance between coach and client, designed to help you, the client achieve your goals and dreams. Determine long and short term goals. Find which steps are needed to accomplish each goal. Decide when are you going to take each step and make you accountable for completing them. Identify possible roadblocks that might get in your way toward accomplishing each goal. A 30 minute free consultation is offered to get you started to have a one-on-one conversation with Sabina and decide if this is the right fit for both of you. Bring your friends and family with you for free! There were a lot of snow days in February keeping us all cooped up! So to make up for it, we’ve created a Friends and Family event for the first week of March! If you have an active pass or membership here at Hatch Yoga, you can bring any friend or family member that hasn’t been to Hatch Yoga yet for one free class! Congratulations YTT graduates of Feb. 2019!!! Congratulations to the graduates of the latest session of Hatch’s Yoga Teacher Training Program taught by Sabina Erlich and Kiran Sohal!